The best beaches in Spain beaches have long been recognized as one of the best places for obtaining bronze tanning and bathing. But among the impressive assortment of sandy coasts and secluded coves so want to choose the best, such that they will be able to give a really paradise vacation! Let’s walk together along the best beaches in Spain, which are washed by the blue waves of the gentle sea. You can appreciate the amazing beauty of this beach at a glance. 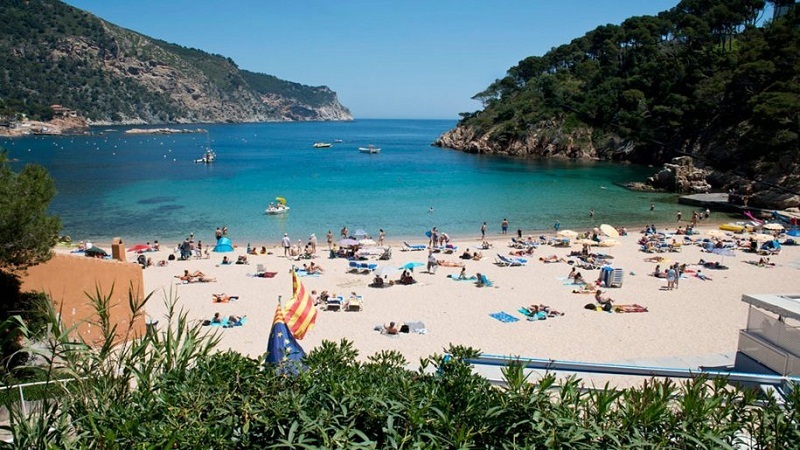 Of all the variety of landscaped sections of the coast, it is the beach of Aiguablava that can claim the title of the most attractive on the Costa Brava. Among the main advantages is the almost complete absence of waves. All thanks to its unique location. The beach is in the heart of the bay. All this in combination with shallow water makes Aiguablava beach one of the most attractive from the point of view of family rest. If you want to spend a full vacation with your family, you can not find a better place! Together with this, it will be wrong to say that the beach is suitable only for those who are used to a measured rest. All those who enjoy extreme sports, looking for new experiences, will also have something to do on the beach of Aiguablava. For example, diving enthusiasts will find many interesting things in the depths of the sea. Having gone down to the seabed, one can get acquainted with such bright representatives of the underwater world as “Sea Cucumbers”. In addition, anyone can rent a boat or boat and go away from the rest, enjoying the measured swaying of the ship on the waves and breathing fragrant air. There is no such air on the whole coast of Spain. Our quest for the best beaches on the coast of Spain leads us to an equally picturesque place called Granadilla. Do you want to isolate yourself from the rest of the world, feel away from civilization? Then you definitely need to choose the beach of Granada, which is located near Javea. 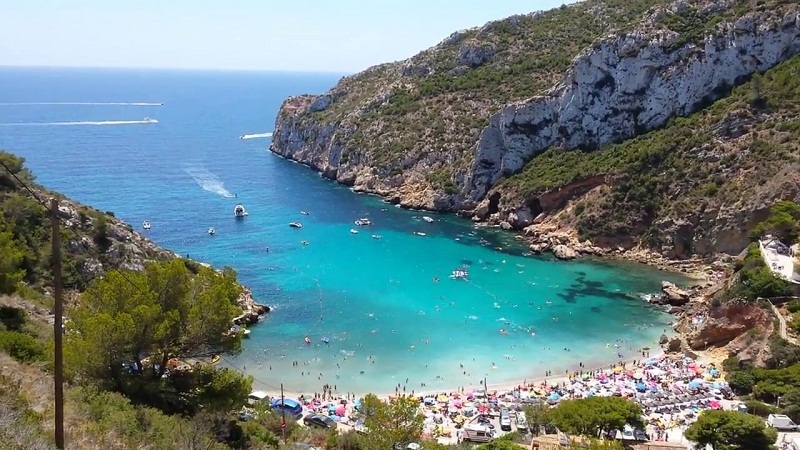 It was this stunning cove that became the winner in the recent competition for the title of the best beaches in Spain. The beach is located in a secluded cove, which is no more than 20 meters wide. Here, simply phenomenal purity, water, the seabed and occasionally swimming schools of fish can be seen even from the height of coastal cliffs. Here and there scurrying fishing boats in search of a good place for the catch. At first sight, you fall in love with this picturesque “Mediterranean postcard”. Going to the beach Granadelya, in advance, stock up on special shoes. This is not a sandy beach. The coast is studded with small pebbles. Many lovers of unusual exotic leisure – snorkeling has long been noted in red pencil on the map of Spain, this is a wonderful place. Not far from the beach are excellent restaurants, where you can enjoy first-class dishes from rice and fresh fish. So gourmets will than pamper themselves. Well, all lovers of attractions, it is worth a stroll to the ancient fortress, located nearby. Not inferior to the above beaches in beauty is another coast of beaches in Spain. The beach of Makarella is famous for the waters of an unusual color, called “blue tourmaline”, and in combination with white sand, the coast looks really fascinating. A small bay will provide a feeling of complete solitude. Therefore, the beach was chosen by nudists, who meet here at every step. At the height of the season, every meter of a sandy beach is filled with tourists, so you need to take places with the first rays of the sun. Otherwise, you can stay without a nice tan. Very great interest in the beach is a favorite for the underwater world. Divers from all corners of the world come to Makarella to replenish their photo albums with new pictures. If you are in Andalusia, you can visit another first-class beach in Spain. This part of the Spanish coast, without a shadow of a doubt, can be called a virgin. The local landscapes appear before numerous tourists and vacationers in its original form. The beach is characterized by clear water and fine sand. Therefore, it is considered one of the best places for family or youth recreation. You can have a snack in one of the nearby restaurants and cafes and stop for a night at the hotel or hostel. Since the beach is very popular among tourists who travel “light”, it is the hostels are a budget option for accommodation for a couple of nights. Going to this Andalusian beach, it is worth knowing that this part of the Spanish coast is prone to winds, so hundreds of surfers come here every year in search of the best waves. A lot of nakupavshis, you can go on one of the many excursions. All interested persons are waiting for acquaintance with whales and other representatives of the marine world, and lovers of antiquities with open arms await the ruins of one of the oldest Roman settlements Baelo Claudia. Well, as you might have guessed, our survey will not do without mentioning the Canary Islands. It is here that the best beach in Spain is located, where tourists from all over the world come to rest. 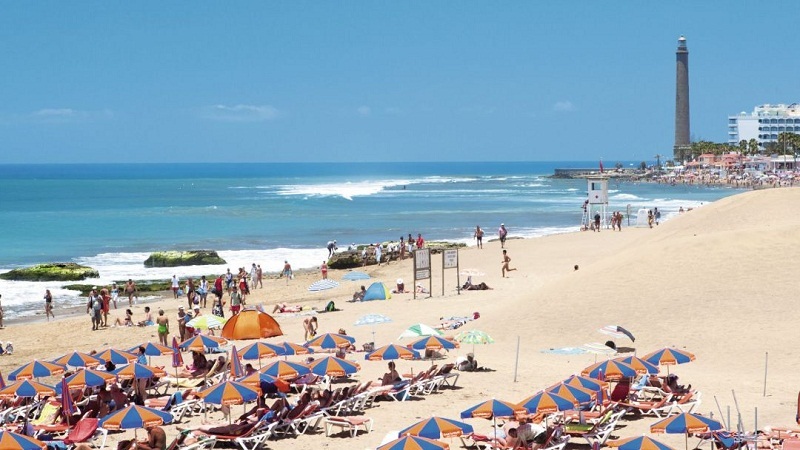 This is Maspalomas beach. What could make a famous tourist like a famous beach? First of all, hardly anywhere else in the world you can find stunning natural dunes from snow-white sand. This place is considered to be one of the sunniest. The sun here almost never comes over the clouds, giving its warmth to all holidaymakers for 4000 hours a year. That’s why the average air temperature on the beach is higher than on any other Spanish coast. There are many restaurants and cafes, shops and attractions, bars and boutiques to tourists. Here you can find everything your soul desires. And yet: they say that the sunset here is incredibly beautiful. Therefore, we strongly recommend that you make sure with your own eyes of the correctness of such an assertion. And, of course, do not forget to bring your camera with you. 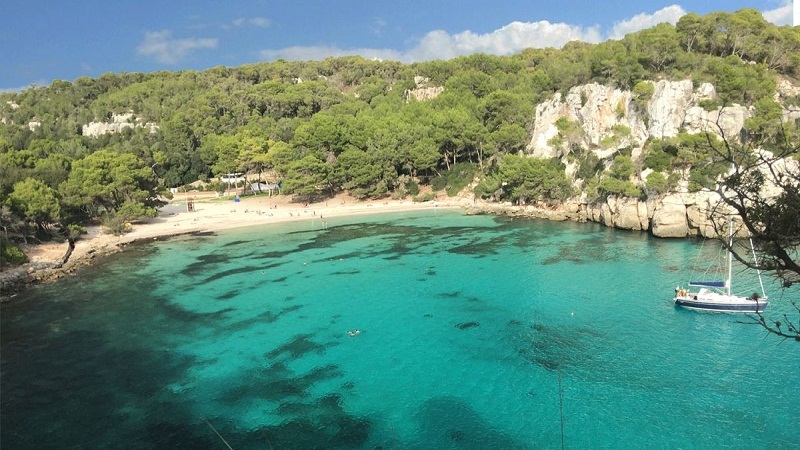 So, we got acquainted with the best beaches in Spain. If you decide to go on holiday on the Spanish coast, our brief overview will be very useful. And we, in turn, wish you new discoveries, vivid impressions and first-class rest in the circle of relatives and friends or in proud solitude! 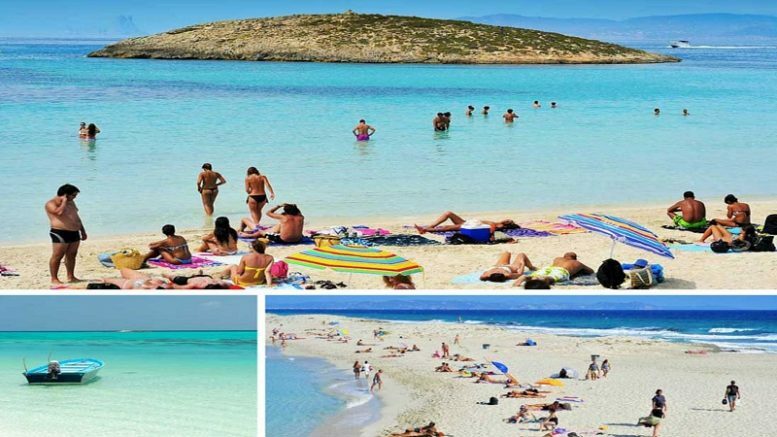 Be the first to comment on "5 best beaches in Spain"